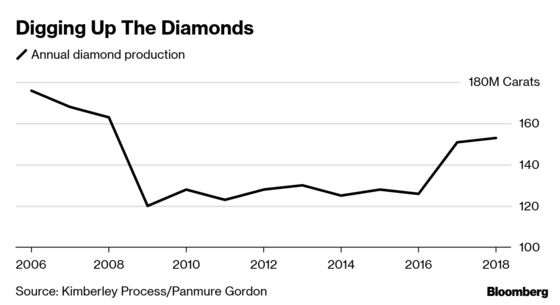 (Bloomberg) -- For more than 15 years, the diamond industry has been telling the world about a looming shortage of gems. Instead, demand has been stubbornly underwhelming, and the miners have done a wonderful job of digging more and more stones. But the pain may soon be over for an industry that’s being squeezed by oversupply. In two separate reports this week, analysts set out forecasts of a tightening market in the next few years, with diamond supply falling into deficit in or around 2021. The diamond business is currently going through something of a mini-crisis. Equities have tumbled amid a slump in prices for cheaper stones, hit hard by too much supply, feeble demand and a weak currency in India, where nearly all the world’s diamonds are either traded or manufactured into jewelry. Global supply peaked in 2006 with 176 million carats mined -- a level that will probably never be exceeded again -- before falling sharply through the global financial crisis. Since then it’s edged consistently higher amid a steady stream of new projects. Now, few new mines are scheduled, and some of the industry’s old workhorses are set to close early in the next decade. Panmure’s Kieron Hodgson said there may be a deficit of 15 million carats, or about 10 percent of global supply, in 2021. Prices for rough diamonds will start to improve in 2021-2022, said Berenberg’s Richard Hatch. Members of the industry will be praying that’s true. Since at least the early 2000’s, they’ve been pinning their hopes on the ‘hungry crocodile’ -- a chart showing two diverging lines resembling an open jaw, with forecast demand outstripping supply. So far the jaws have stayed stubbornly clenched, and the long-awaited diamond deficit has failed to materialize.